Mould and Mildew – What is the difference? With showers, baths and sinks, bathrooms are prime targets to suffer from damp and mould. All that heat and steam must go somewhere, and whilst opening the window is a free solution, unfortunately it doesn’t always solve the problem of damp in the bathroom. 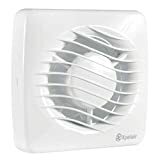 The best method to eradicate damp is an extractor fan for condensation, particularly for bathrooms with no windows, so whats the best extractor fan? Once you have decided to get an extractor fan, you need to consider what sort you need. Even if you are getting someone else to install it for you, it’s useful to know a little about them so you can ensure the right one is being fitted. There are two main types of fan – the Axial fan, mounted straight into a window or a wall, using ducting, and Centrifugal, often mounted into the ceiling, and able to overcome the air pressure resistance created by lengths of ducting. You also need to consider how powerful the fan needs to be, based on how many times per hour the air in the room needs to be completely changed. As a rule of thumb, you are looking at changing the air somewhere between 6 to 20 times an hour, depending on whether you have just a simple WC, through to a bathroom with shower. You then need to multiple this by the volume of the room (length by height by width) to find the best extractor fan for condensation. Manrose produce a good range of entry level extractor fans, starting at around £17 for the fan and fixing kit (sold separately, ranging in price from £5-17, depending upon brand). You can pay more for a sleeker looking grill, along with built in timers. 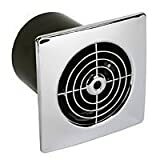 A chrome finished low profile Manrose extractor fan is around £17. Xpelair produce a midrange priced range of extractor fans, however their fans include a fitting kit, and start at around £20. Vent Axia are another well-known manufacturer, producing top end fans, with fitting kits priced at £17 and fans themselves from £30. It is also possible to get extractor fans with built in lights – expect to pay around £60 for these. It is best to position the fan opposite the door, allowing the air to circulate from the door to the fan, however as fans really need to be placed in an exterior wall or window, this is not always possible. However you should make sure you don’t place the fan too close to the door as otherwise it will be less effective in removing damp. The extraction fan for condensation will depend largely upon the type of bathroom you have and the sort of damp in the bathroom you are looking to combat. As consumer tastes have developed, the market has expanded to produce high end fans combining lights and incorporating thermostats and timers, however the basic sort that come on with your lights are often sufficient. Too complicated a product, and you may find it costing a lot to run when you have no need of it. What is The Best Mould Remover?